Requires 12x12 cutting capacity. This 11" tall card evokes the "magical" feelings of the Nutcracker Ballet and Clara's "growing" Christmas tree that takes us into the miniature world of the Nutcracker Prince and the Mouse King. Dimensional card folds flat for giving, then reshapes into a box for display. Three trees on bridges with penny slider mechanisms to grow the tree taller. Tree layers show through as lights (add other circle punches or studs and jewels as desired for more color). Taller back panel includes three stars. Front panel includes three-layered poinsettia flowers with hole punches for mini brad centers. Accent offset side, front and inside back panels for more options. 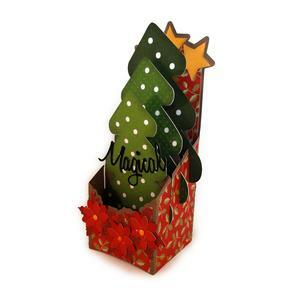 View an assembly tutorial at http://needlesnknowledge.blogspot.com/2015/11/noel-growing-tree-box-card-assembly.html. A SnapDragon Snippets design.